One of the big benefits of remittances is that, unlike development aid, they flow directly into the pockets of the intended person. “The strength of remittances is how they are dispersed,” said Mathieu Jacques, manager of the EU-funded ACP-EU Migration Action Programme (ACP stands for African, Caribbean and Pacific countries). In some of Africa’s smaller or impoverished nations, remittances are literally keeping their economies afloat. According to the World Bank’s Migration and Remittances briefing,money sent by immigrants make up a significant share of gross domestic product in African countries such as Liberia (27 percent), The Gambia (21 percent) and Comoros (21 percent). But even if remittances have the power to lift individual families out of poverty, their effect on a country’s economy as a whole is unclear. Some studies suggest remittances help fuel economic growth; other are less conclusive. 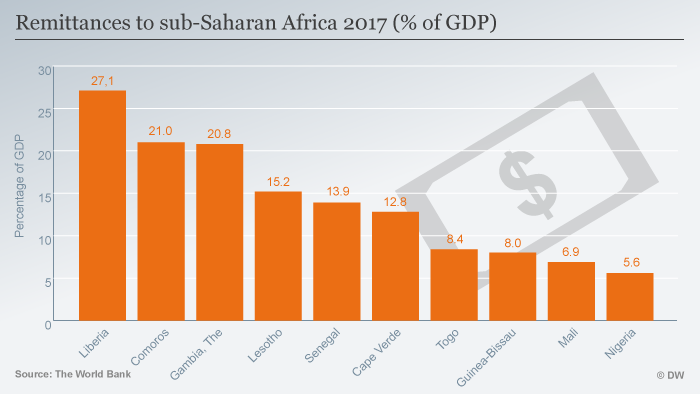 It costs more to send money to Africa – the world’s poorest region – than anywhere else in the world. This means expensive fees eat up a chunk of cash that could otherwise help the receiving families. 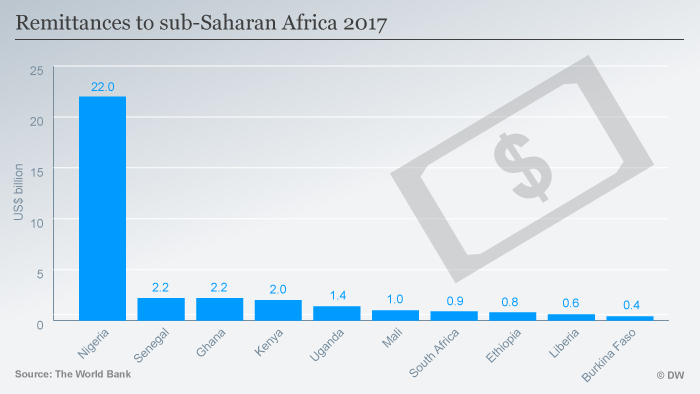 The average fees for transferring remittances to Africa was 9.4 percent in 2017, the World Bank found. This is a slight drop from 2016 (when it was 9.8 percent) but it’s still a far cry from the Sustainable Development Goal of slashing transaction costs to 3 percent by 2030. “Countries, institutions, and development agencies must continue to chip away at high costs of remitting so that families receive more of the money,” said Dilip Ratha, lead author of the report, in a press release. Companies like WorldRemit that offer cheaper transaction fees below 4 percent have limited resources compared to their much larger competitors to reach out to people in rural parts of the African continent. It’s not just the cost of transferring money that is a stumbling block. Sending cash via money transfer companies also usually requires showing a passport or identity card which migrant workers might not have, or might not want to show because they lack work permits or visas. Many are putting their hopes in mobile money transfers as a way of cutting fees and making it easier for people to send and receive money across Africa’s borders. Some services are already offering cross-border mobile payments – although there are still issues such as compatibility and regulatory differences between countries that need to be ironed out.